The Boston Red Sox found a bona fide closer on Dec. 26, 2012. At least it sure looked like they did. In a six-player deal, Boston acquired back-to-back All-Star Joel Hanrahan from the Pittsburgh Pirates. Hanrahan was coming to town after chalking up 76 saves in 2011 and 2012 when he posted ERAs of 1.83 and 2.72. Hanrahan was only under contract for one year heading into 2013, but the Red Sox knew they had a reliable man to hand the ball to in the ninth inning for at least one season. As it turns out, the 2013 Red Sox won the World Series thanks in large part to a dominating closer, but it certainly wasn’t Hanrahan who Big Papi was throwing over his shoulder after every win. He turned out to be a major bust, pitching just 7.1 innings for the Sox. His ERA swelled to 9.82 before he underwent Tommy John surgery. To land Hanrahan, the Red Sox sent reliever Mark Melancon, first baseman/outfielder Jerry Sands and infielder Ivan De Jesus Jr. to the Pirates. Nobody was sad to see Melancon go. He proved right away that he didn’t have the mental makeup to pitch in Boston. Still, after Hanrahan announced he was shutting it down for Tommy John, we hated that the Red Sox sent anything more than a case of balls to Pittsburgh for the pitcher. It wasn’t exactly Jeff Bagwell for Larry Anderson, but the trade for Hanrahan was looking like it would be monumentally bad. 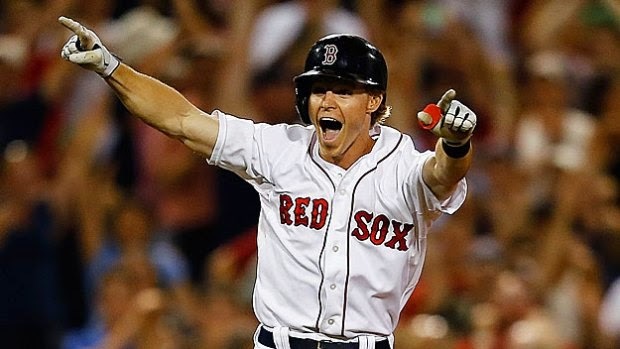 Luckily for the Red Sox, a little-known infielder named Brock Holt was thrown into the trade with Hanrahan. He was a prospect who was at least close to Major League ready, judging by his 72 plate appearances with the Pirates in 2012. He hit .292 with two doubles and a triple. The throw-in infielder was hardly a big-time prospect. Baseball America ranked Holt No. 27 in the Pirates organization in 2010. He wasn’t featured in the Baseball America’s annual Prospect Handbook the following years, however. Holt end up playing in 26 games for the Red Sox in 2013, and he didn’t exactly set the world on fire. He hit .203 with two double and 72 plate appearances. We didn’t get to know the real Brock Holt until last season. That’s when we realized the Hanrahan trade might have been a steal after all. Holt was called up because of an injury to Will Middlebrooks, and he ended up playing 106 games for the Red Sox. He played every position but pitcher and catcher, and was superb in the field and electrifying at the plate before a concussion ended his season. Those 106 games were the highlight of a lost season. He was not only arguably the MVP of the Red Sox last year, he was one of the only reasons to watch the team at all. This past offseason the Red Sox signed Pablo Sandoval to play third base, and they started hoarding outfielders starting with last year's late-season signing of Rusney Castillo. After a year of messing with his head, the team is recommitted to Xander Bogaerts at short, and rightly so. With Dustin Pedroia and Mike Napoli and his new jaw firmly entrenched on the right side of the infield, Holt is left without a position. That relegated Holt to the role of “super-utility player,” a term that seems silly and fitting at the same time. So far this season, Holt has started in center field, second base, shortstop and third base. After Monday’s start at third, Holt has gone 37 games without committing an error. Holt is still electrifying. He has appeared in eight games and is batting .462. Behind Mookie Betts, Holt might be Boston’s most exciting player to watch. On the rebuilt Red Sox, Holt isn’t an everyday player, which has to give Sox fans reason to believe that the 2015 lineup has the potential to be something truly special. He is, however, a backup for whom John Farrell can’t help but find a reason to rest one of his everyday players nearly every day. While he might not be best player at any position on the Red Sox, the Red Sox are definitely a better team every night their super-utility player is in the lineup. Yes, Hanrahan was one of the biggest trade busts in team history. Sadly, he hasn’t thrown a pitch in the Major Leagues since his surgery. Thanks to Holt, the Red Sox and their fans would still make that trade again in a heartbeat.